After the indulgences of the Christmas and New Year season, it can feel good to cut back on a rich foods and take a step away from heavy dishes with lots of meat in and take on a lighter diet. That doesn’t need to be boring though. Lots of people have been doing Veganuary this year and even though we haven’t gone that far, we have been trying to incorporate more vegetarian and vegan food into our diets and cut back on meat, fish and dairy a little. 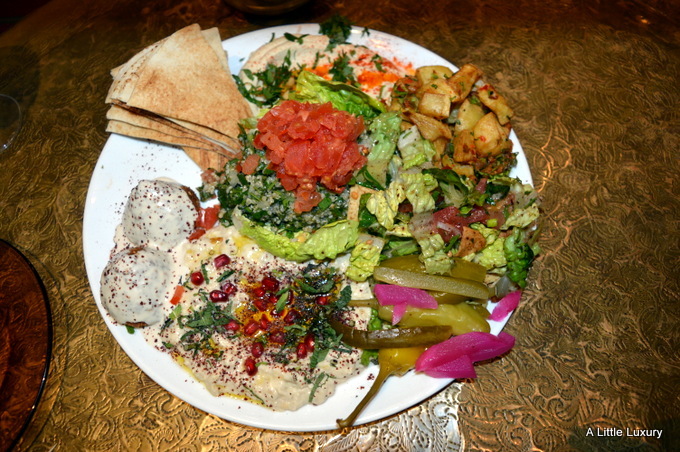 So when Comptoir Libanais got in touch and asked me to try out their Veganuary menu, I was really interested to try it out their vegan feast at the Birmingham branch in Grand Central. Comptoir Libanais are celebrating have launched a special Lebanese Vegan Feast menu offering a variety of colourful and tasty vegan dishes. The menu will be available throughout January at all Comptoir Libanais restaurants for a very reasonable £12.95. 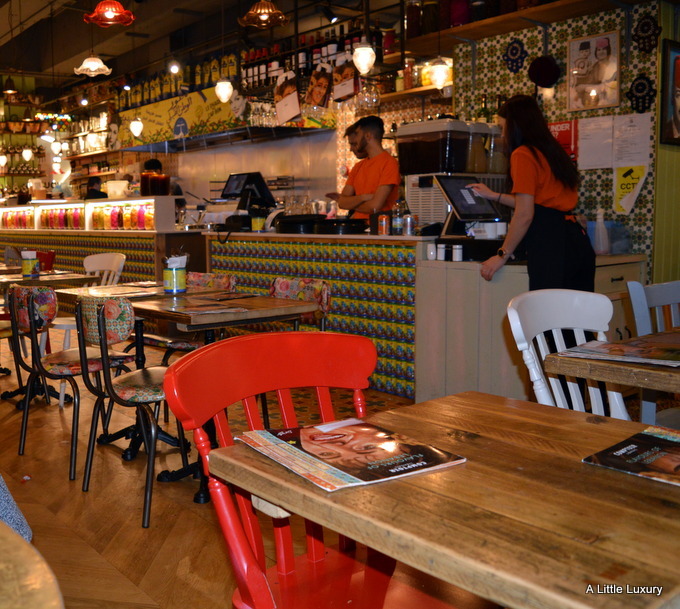 We started off by nibbling away at some tasty Marinated Damascus Olives and a Selection of Pickles whilst we took in the colourful, atmospheric decor which certainly makes you feel like you are somewhere exotic. There are fez hats on the walls and some wonderful tiles, you can even buy a range of goods which have that Middle-Eastern vibe. We moved onto the mezze selection of Red Pepper Hommos, a smooth chickpea puree with tahina and red peppers, virgin olive oil, served with pita bread and a Quinoa Tabbouleh, which is made from chopped parsley, quinoa, tomatoes, mint and onions with a lemon and olive oil dressing. The red pepper hummus was delicious and moreish, plus the flatbreads were perfect to mop it up. The quinoa tabbouleh was the perfect foil to it with its fresh, citrusy zing. 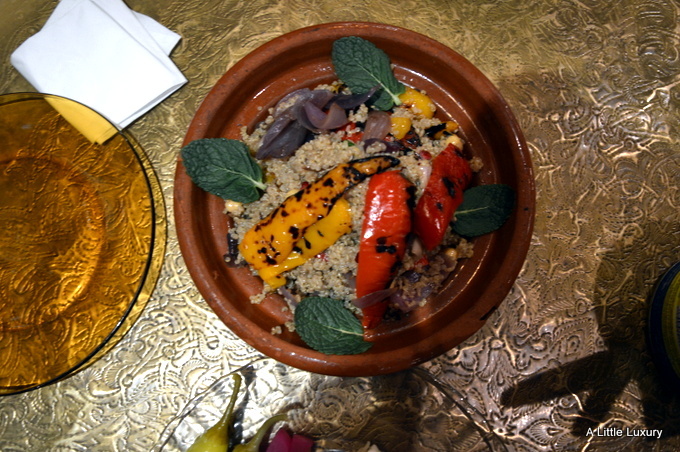 I really enjoyed the delicious Couscous Salad with grilled peppers, roasted squash and mixed nuts. It was very tasty. The other choice of main was the Aubergine Tagine which sadly wasn’t available on our visit due to supply problems. 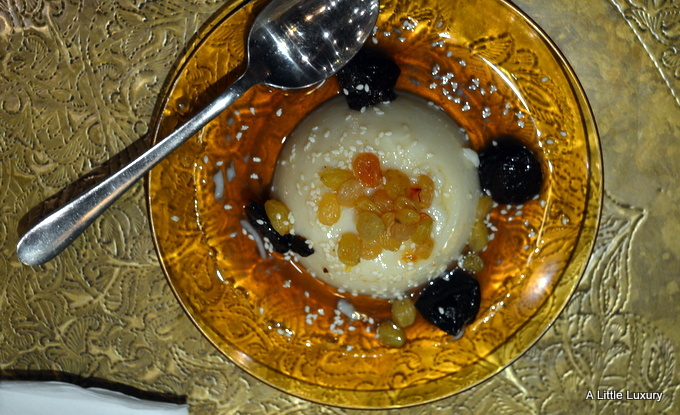 For dessert there is a Coconut Mouhalabia and Mixed Dried Fruit. It’s a traditional Lebanese milk pudding made using coconut milk and topped with toasted pistachios. The coconut mouhalbia which was like a panacotta with a smooth texture and a lightly sweet flavour. We loved the sweet fruits on the top and the sweet honey syrup that was poured on top. For liquid refreshment between us we tried a couple of beers: Almaza and Casablanca (Casablanca was the better of the two) and Leymona, which was a really tasty and thirst-quenching lemonade with flavours of lemon and lime. The service was excellent: attentive and friendly. The staff were knowledgeable about the food on the menu and we were very well looked after. I’ve never eaten here before but these dishes look so colourful and delicious! All the dishes look wonderful. I am dairy free and have tried to eat less meat this month too, but it’s definitely not easy. It looks very atmospheric with the decor and the lovely food – like being on holiday. I love Middle Eastern food, and this sounds like a great meal. Shame it’s only for Veganuary, I’d have it any time of year. I love middle eastern food! Its mostly vegan friendly and so easy to make at home. I will definitely be trying this restaurance!